Stay in shape for less with Duet Fit! Enjoy all the fitness you want from only 29,90€ per month! It can be tough to stay fit during your time abroad, with busy schedules, yummy Spanish food and unnatural party habits. But, thats where Duet Fit comes in! If you’re looking for a reliable, affordable gym with a wide variety of classes, and equipment, Duet Fit is the place for you. Duet Fit prides itself on having an innovative range of technology solutions and supportive fitness spaces of thousands of square meters. 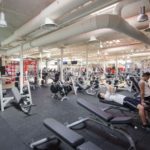 These spaces are equipped with hundreds of workout machines for cardio training and toning. 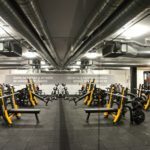 The equipment is extremely accessible to fully cater to your fitness needs! 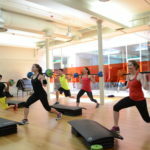 If you need more of a push, with a guide or group of motivated people, Duet Fit also provides a wide range of collective workout classes which you can join anytime at no additional cost! Their weekly schedule is jam packed with several different types of guided workouts for all different levels of skill. 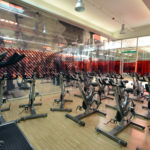 From circuits and crossfit to cycling and full body workout classes, the choices are endless! 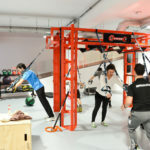 Classes are lead by professional trainers or take place virtually in their fitness classrooms. Also have a look at our free Get in Shape fitness classes! 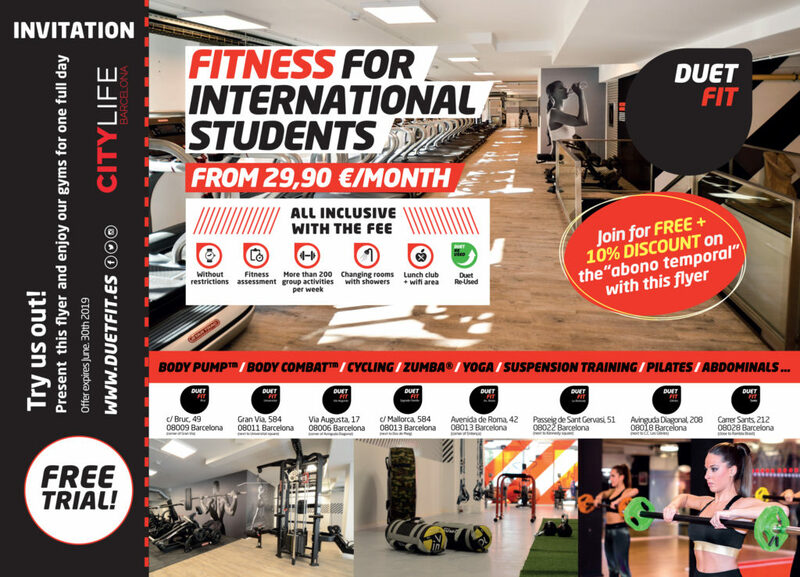 – Save the registration fee with this voucher! – 10% additional discount on the “abono temporal”! – Come and go as you please! Flexible contract duration – you pay month by month! – No Spanish Bank Account rerquired, you can pay with your credit cards! All you have to do is to show the discount flyer (on your cell phone) and stop by your nearest Duet Fit! For more information on the services offered by Duet Fit, also check out their official website! If you have any questions, send us an email to info@citylifebarcelona.com. Enjoy your workouts! For a chance to win free gym memberships, make sure to enter our weekly raffle! 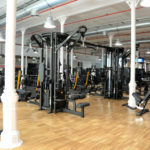 Keeping fit in Barcelona: Sports, Gyms & More!